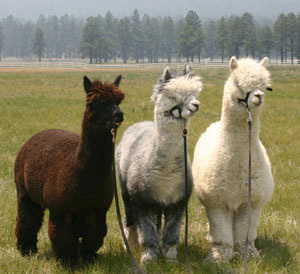 When it comes to Alpacas, we're Arizona's best kept secret! 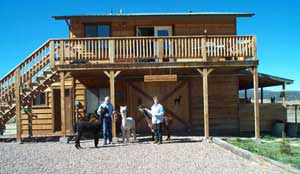 We are a small breeding ranch located in the White Mountains of Arizona near the New Mexico border. We offer quality animals for sale with an emphasis on greys and blacks. We also breed and sell Llamas for packing and pleasure. Please feel free to come visit us in Alpine to see what we have to offer... We look forward to meeting you! Being BIG didn't save the Dinosaur... We may be small but our Guys have it All! Our three herd sires come from quality Peruvian and Chilean bloodlines and have incredible fiber density, crimp, and coverage. "Successfully breeding black and grey offspring!" While others dream in the colors of the rainbow... we tend to dream in shades of Grey. Click here to see a promo sheet with a picture of the playful black & grey crowd that hangs out at our ranch.